Rupert Murdoch: Could his US empire be affected? The phone-hacking story has brought down a newspaper that few in the US had heard of. But the implications could yet be felt across the Atlantic. The closure of the UK's News of the World newspaper made headlines in the US, despite the paper being little-known. There was outrage at the methods used by British journalists to get a story - the hacking of phones and payments to police officers. And there have been questions about how much this could hurt Rupert Murdoch's huge media empire, News Corporation, which suffered a 7% drop in its share price on Monday in New York. Even before he closed the News of the World, Mr Murdoch's UK newspaper operations formed only a small part of his huge global business, much of which is in the US. Even if they don't know it, millions of Americans are consumers of Murdoch-owned media. More than half of Mr Murdoch's profits come from his Fox TV operation in the US, which produces hit shows like American Idol and encompasses no fewer than 27 local Fox networks. The Fox News Channel is available to more than 100 million US households and is dominant on the media landscape, arguably eclipsing long-established broadcasters like CNN. Fox's right-wing stance and strong links to the Republican party have often drawn criticism, but its popularity is unquestioned. Beyond news, Mr Murdoch also has huge influence in the film industry, through his Hollywood studio 20th Century Fox, behind a string of recent blockbusters including 3D pioneer Avatar. Despite all those assets, could his grip on the American media be weakening, given the setbacks he has suffered elsewhere? "So far, most of this has been focused on London and hasn't had any impact for his US media organisations," says Bloomberg Businessweek reporter Felix Gillette. "But at a certain point, it's going to raise more scrutiny for his US properties, particularly for News Corporation's flagship tabloid, the New York Post." The venerable Post was first bought by Rupert Murdoch in 1976 and has remained perhaps the best-known of America's brash city tabloids. Many are now questioning whether the relationship between Murdoch's media outlets in London and the UK political establishment is an improper one, and the same issue is likely to be asked in the US, Mr Gillette says. "Particularly with Fox News and its relationship with the Republican party and the conservative establishment," he adds. Already, a group called Citizens for Responsibility and Ethics in Washington (Crew) has called on the House of Representatives and Senate to investigate whether journalists working for News International have hacked into the voicemail of Americans. "If Mr Murdoch's employees can be so brazen as to target the British prime minister, then it is not unreasonable to believe they also might hack into the voicemails of American politicians and citizens," says Crew executive director Melanie Sloan. The US regulator, the Federal Communications Commission, said on Tuesday that it has no plans to investigate News Corporation. But there is speculation about the impact the scandal could have on Mr Murdoch's heir-apparent, his son James, currently chief executive and chairman of News Corporation in Europe and Asia. 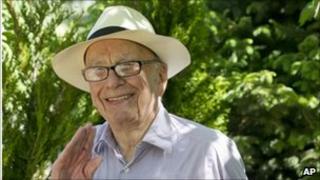 The younger Murdoch fielded media questions last week and spoke about his shock at the allegations. He also said, in a statement announcing the closure of the paper, that he approved out-of-court settlements with hacking victims when he did not know the "full picture". "This was wrong and is a matter of serious regret," he added. But at the weekend, former UK Home Secretary Alan Johnson said this made James Murdoch possibly liable for prosecution in the UK under the Regulation of Investigative Powers Act (Ripa). "Section 79 talks about the role of company directors etc, and talks about consent, connivance, neglect. "So even if you weren't involved, even if you weren't conniving, there is some issue where you did not know what you should have known, that brings you into the terms of the act. I think that is significant." James Murdoch is not the only individual based in the US who could find himself under pressure. Les Hinton, the former chairman of News International, and now one of Mr Murdoch's most trusted aides, is facing questions over how much he knew about the hacking and when. A Murdoch employee for 52 years, Mr Hinton is now the boss of Dow Jones, publisher of the Wall Street Journal, which Mr Murdoch acquired for $5bn (£3.15bn) in 2007. Mr Hinton was approached by the BBC on Monday but refused to comment. Some legal experts have raised the possibility of action against News Corporation under US federal law. The Foreign Corrupt Practices Act (FCPA) outlaws the bribery of foreign officials. Butler University law professor Mike Koehler, who for 10 years took part in FCPA investigations, says: "Given what is known at this point, I think it's likely that the Justice Department and the SEC [Securities and Exchange Commission] would investigate the conduct at issue here and potentially have an enforcement action. "Police officers are foreign officials under the FCPA and the business purposes [in question] would be to help get information to help the News of the World to write stories and sell newspapers." An investigation under FCPA takes several years and is usually preceded by an internal review of the company's global operation, a very costly exercise paid for by the business, says Mr Koehler. Avon Products has disclosed that it spent £100m on reviewing its operations after an FCPA issue was raised in China in 2008, he says. But other lawyers are more sceptical. Tony Woodcock, of law firm Stephenson Harwood in London, says the possibility of an FCPA investigation into News Corporation is a "long shot". There is already one US lawsuit related to the current scandal. News Corporation is being sued by a group of shareholders who allege a failure of corporate governance. The lawsuit was filed in Delaware by Amalgamated Bank and a group of pension funds, and is an updated version of a previous action. The BBC asked News Corporation to comment on the current issues, but has received no reply. A lot has happened in the past week, and the firm now finds itself in the unusual position of making the news, rather than writing it. The Murdochs will be hoping that the phone-hacking scandal remains one British story without trans-Atlantic appeal.